Autophagy defect is linked to loss of muscle in aging for the first time. Sarcopenia is the aging-related loss of skeletal muscle mass and strength. Preventing sarcopenia is important for maintaining a high quality of life (QOL) in the aged population. However, the molecular mechanism of sarcopenia has not yet been unraveled and is still a matter of debate. Determining whether the levels of autophagy-related mediators, in this case p62/SQSTM1 and LC3, in muscle change with aging is important to understanding sarcopenia. Such information could enhance the therapeutic strategies for attenuating mammalian sarcopenia. 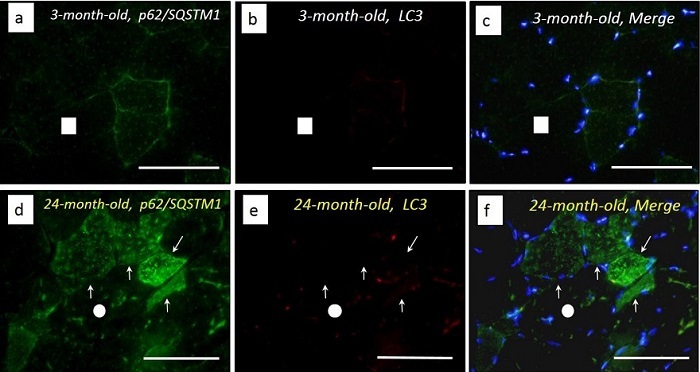 Now, researchers from Toyohashi Tech have found a marked accumulation of p62/SQSTM1 in the sarcopenic quadriceps muscle of mice using two different methods namely western blotting of cell-fractionated homogenates and immunofluorescence. In contrast, the expression level of LC3, a partner of p62/SQSTM1 in autophagy progression, was not modulated. The opensource study is published in the Journal of Cachexia, Sarcopenia and Muscle. Previous studies show that autophagy is a self-degradative process that is important for balancing sources of energy at critical times in development and in response to nutrient stress. Autophagy also plays a housekeeping role in removing misfolded or aggregated proteins, clearing damaged organelles, such as mitochondria, endoplasmic reticulum and peroxisomes, as well as eliminating intracellular pathogens. Thus, autophagy is generally thought of as a survival mechanism, although its deregulation has been linked to non-apoptotic cell death. In addition to elimination of intracellular aggregates and damaged organelles, autophagy promotes cellular senescence and cell surface antigen presentation, protects against genome instability and prevents necrosis, giving it a key role in preventing diseases such as cancer, neurodegeneration, cardiomyopathy, diabetes, liver disease, autoimmune diseases and infections. In earlier studies, autophagic defects were detected in the sarcopenic muscle of mice, rats, and humans. However, the team state that these studies involved only western blotting analyses of crude not cell-fractionated muscle homogenates. Thus, the researchers state that the data from these studies were insufficient to describe the adaptive changes in autophagy-linked molecules within sarcopenic muscle. The reasearchers state that autophagic defects improves the understanding of the mechanism underlying sarcopenia. The researchers would like to further study this mechanism with an aim to attenuate sarcopenia by improving this autophagic defect using nutrient- and pharmaceutical-based treatments. P62/SQSTM1, but not LC3, is markedly expressed in the cytosol of muscle fibers of sarcopenic mice. Credit: COPYRIGHT (C) 2015 TOYOHASHI UNIVERSITY OF TECHNOLOGY. ALL RIGHTS RESERVED.